I love this watch! I had to get 3 links taken out to fit. It's a very heavy watch but it looks fabulous! The dial of this Michael Kors watch features stunning cubiczirconia gemstones encrusted along the continents of the world fora unique, beautiful look. This stainless steel timepiece has acalendar date display and push-button deployment. Great price for a solid MK watch. My wife absolutely loves it. My daughter was thrilled to get this as a gift from me ...... Unknown to me, she had been eyeing this watch for awhile, so it was a big hit ! Very classy and great looking watch! Great buy and it's even water resistant! I can't wait to wear it during my travels! I always get compliments every time I wear this watch. It's big but still looks feminine enough. 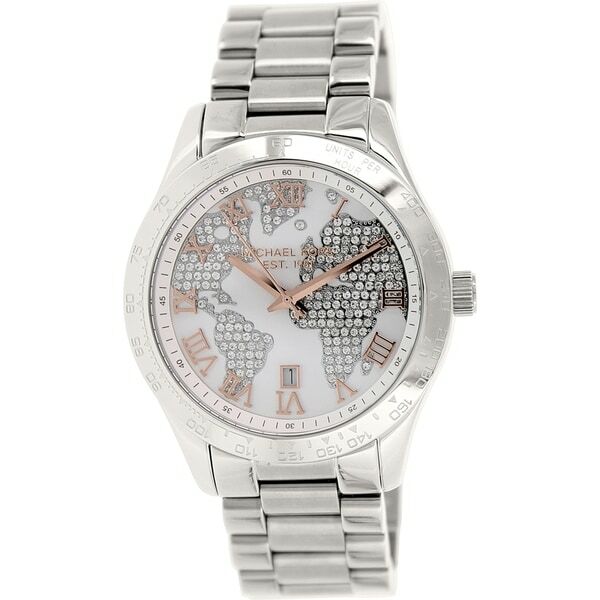 Showing off the map of the world always take people by surprise as most people have not seen a watch like this one. It's a bit heavy but comfortable. Absolutely gorgeous. My friend loves it. Big hit!